It’s Monday morning and so far every single person I’ve met has asked me, “Did you do anything fun last weekend?” Well, yes, I did. For one, I competed in the first round of the Crossfit Open, which is the qualifying competition for the Reebok Crossfit Games. I obviously have zero pretention to actually being competitive enough to move on past the local level, but I decided I’d give it a try. I’ve been doing Crossfit for a couple of years now, and all my friends and coaches at the gym had signed up and were encouraging me to give it a try. The competition was on Saturday morning; my round was at 9:50. I had a taped lane with a pullup bar, a barbell, a bunch of weights and a judge. My task: In 9 minutes, complete as many rounds as possible of 15 toes-to-bar, 10 deadlifts (85lbs) and 5 snatches (85lbs). After that, I’d have 6 minutes in which to achieve a 1-rep max doing a clean and jerk. I’m not going to lie: I was super nervous. I’m a neurotic perfectionist; I hate failing; I hate looking like an idiot; I hate being weak; I hate not being the best at what I do. So to go into a competition where I knew I’d be doing really hard things in front of a judge and an audience was way outside my comfort zone. And that’s exactly why I did it. Thanks to hard work, talent, blessings and, frankly, a lot of luck, I’ve spent most of my life doing things really well, succeeding with aplomb. It’s good sometimes to go outside the comfort zone and feel those nerves and sense of inadequacy and competition and desire to get better. And, truth be told, I did fine. And by “fine” I don’t mean in terms of score (my score is here, but I don’t know how to interpret it); instead, I mean that I completed the workout with integrity and roughly at the level that I expected to. I was weaker than expected in the toes-to-bar (my grip was shot after the first couple rounds) but strong in the deadlifts and better than expected in the clean and jerk (I maxed at 125 lbs, which is a personal record). So overall it was a positive experience, and now I’m looking forward to the next workout at the end of this week. If the Crossfit Open was outside my comfort zone, my other weekend activities were squarely within: On Saturday night, I went to a Seattle Symphony concert, where I saw them perform Mozart’s Overture to the Marriage of Figaro and his Piano Concerto No. 22, and Beethoven’s First Symphony. All three pieces were nice and familiar, and I continue to be impressed at the quality of the symphony’s sound. 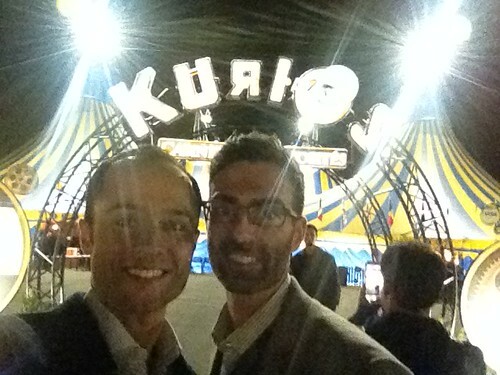 On Friday I went with Justin and his family to see Cirque du Soleil’s traveling show, Kurios. Set up in a giant, multi-colored tent on the outskirts of town, it reminded me of Dumbo — that opening sequence when the men are raising the tent, and then later when the enraged mother brings the whole place down around their ears. Fortunately for us, there were no enraged elephant mothers protecting their children — only fantastic acrobats and circus performers. 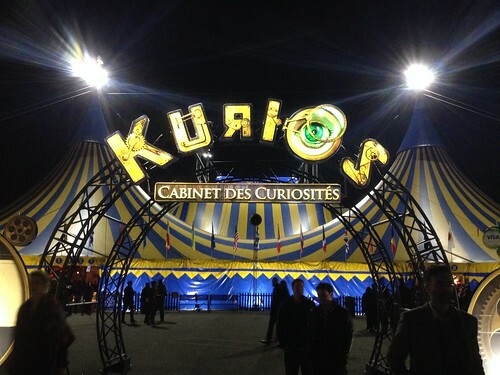 As with any Cirque show, the aesthetic was elaborate and the acrobatics wonderful. I missed the large-scale spectacle of the permanent Las Vegas shows, but I also appreciated the authentic circus feel of seeing everything under a big-top tent on a more accessible human scale. Justin and me in front of the tents.